I've tried everything, firewalls, reinstalling etc etc. I can't get the debugger to connect no matter what I do. The Flash Builder debugger failed to connect to the running application. Running the program without debugging works fine. I believe this indicates that the tcp connection between ADL and Flash Builder could not be established using port 7935 because the socket is in use. Use netstat to assure the port is not in use. Needn't care about if the connection is successful. Close Browser, re-launch FB4.6, open your AIR application, Debug, -- the problem is gone. I recently encountered the same issue in OSX. I resolved it by reinstalling the debugger version of flash player for mac, and changing the flash player browser to Safari in the Flex preferences. The guy at this link Unrecognized Windows Sockets error: 0: JVM_Bind in Flash Builder has a workaround. Problem is you have to do it everytime. He suggests using TCPView to see and close opened connections that are using the same port as the debugger. People in this thread http://forums.adobe.com/message/653125 also notes that an old version of NOD32 was causing the problem. The second error you get clearly indicate a problem with the Java Virutal Machine (JVM). I don't think it's project related at all. Try checking out installed JREs (Java runtime environments) in Flash Builder. Check if there's anything strange here, like unknown JREs. You should use "Adobe Flash Builder 4.6", typically located at "C:\Program Files (x86)\Adobe\Adobe Flash Builder 4.6". If it's not here add it (Add, Next, paste corresponding path) and restart Flash Builder. If it's already there, you might want to redownload Flex 4.6 SDK and replace your current one (typically located at "C:\Program Files (x86)\Adobe\Adobe Flash Builder 4.6\sdks"). It's unclear if you have uninstalled Flash Builder or not but if that's not the case and the above solutions doesn't work I'd considered reinstalling it from scratch. I had the same issue. I'm using Google Chrome as my default browser, and although I had flash debugger installed (both IE and the "other browsers" version), I got this error. 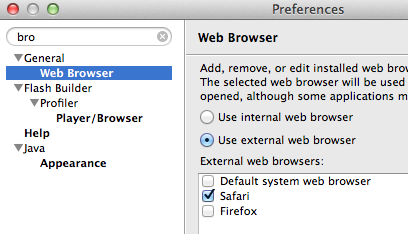 I opened mozilla firefox and set that as default browser. Now I re-opened FB, and the error was gone. I think this has to do with Google Chrome having flash build internally which might be slightly off. If your default browser is Chrome, you must set the default Flash plugin before debugger starts to work. Click the [+]Details button at the right top side of the list. Find the Adobe Flash Player from the plugins list and disable internal ones. After spending way too much time on this and trying everything suggested and more, the solution unfortunately was to reformat the laptop and try again. Thanks for everyone for their responses and efforts. I've closed chrome web browser. Then I can execute the debugger without that msg. I suspect some tab used that port. Happened to me just now, it happened after closing a debug Air app right after it launched. I had to restart the pc, problem solved. Not the answer you're looking for? Browse other questions tagged flash flex debugging air flash-builder or ask your own question.